The McGann family say that they have been left “shocked” by the ordeal that had been “thrust upon them”. THE FAMILY AT the centre of an eviction from their home in Strokestown, Roscommon over the weekend, has released a statement saying that they’ve been left “shocked” by the ordeal that had been “thrust upon them”. The Roscommon eviction has made headlines this week following what gardaí have described as an incident of “criminal damage and assault”. An eviction order in relation to the home was executed last week, during which three members of the family were forcibly removed. 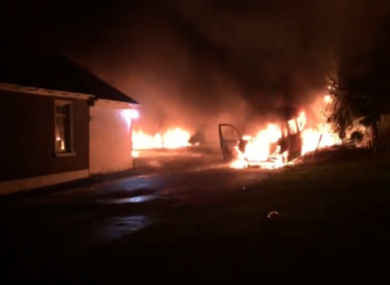 A number of vehicles were set alight and three of those attacked required hospital treatment; a dog was also seriously injured and had to be put down as a result. The McGann family, who released the statement through their former neighbour Sinn Féin MEP Matt Carthy, said that their circumstances were “further compounded” by the “inaccurate and ill-informed media coverage of our eviction”. They added that they were disappointed in Taoiseach Leo Varadkar’s comments today. The family said that he has “yet to adequately respond” to the incident, and asked him to “refrain from making comments that further compound” their distress. “We believe our plight has been exploited by some wishing to further their own narrow agendas and we were particularly disappointed at comments made today by An Taoiseach Leo Varadkar during Leaders’ Questions in the Dáil. His remarks, we believe, are a deliberate attempt to deflect attention from some of the very serious issues relating to our eviction. He also asked that Doherty condemn tax evasion, and added that ”nobody ever wants to see people evicted from their homes, particularly at Christmas time”. Where evictions occur they should only ever happen in rare cases after the court has heard both sides of the story and has issued a repossession order first and an eviction order thereafter. That, I understand, happened in this case. Earlier this evening, Roscommon-Galway TD Michael Fitzmaurice said that “while the Taoiseach is correct that violence will never solve anything, it was also remiss of him not to remember back to last Tuesday when innocent people were beaten by so-called security personnel carrying out an eviction”. Fitzmaurice called for negotiations between the two sides to come to a resolution; he said that they must also be “mindful” of two siblings who have lived in this house for over 60 years and who “weren’t taken into account by the bank”. The family’s statement adds that their case is with two firms of solicitors who are now acting on their behalf and that matters relating to their eviction will be heard before the courts. They also thanked the public for their support. “Our family has been overwhelmed by the levels of support we have received and we wish to pay special thanks to our neighbours and friends who have greatly helped us during a very traumatic time. - with reporting from Sinéad O’Carroll. Email “Roscommon eviction family say they're 'disappointed' in Varadkar's Dáil comments”. Feedback on “Roscommon eviction family say they're 'disappointed' in Varadkar's Dáil comments”.